Bring the superb beauty of Amish furniture into your home with our Amish 60" Lucern Mission Open Single Bathroom Vanity Cabinet. Create the oasis that you have always dreamed of using only the very best in solid wood construction. This piece is handmade in northern Indiana by skilled Amish woodworkers and you will certainly be able to notice! With ample counter and cabinet space, you will be able to organize all of your bathroom essentials in an attractive way. Two usable drawers add yet another layer of storage that you'll love the convenience of. Grab your must-have items at a moment's notice. 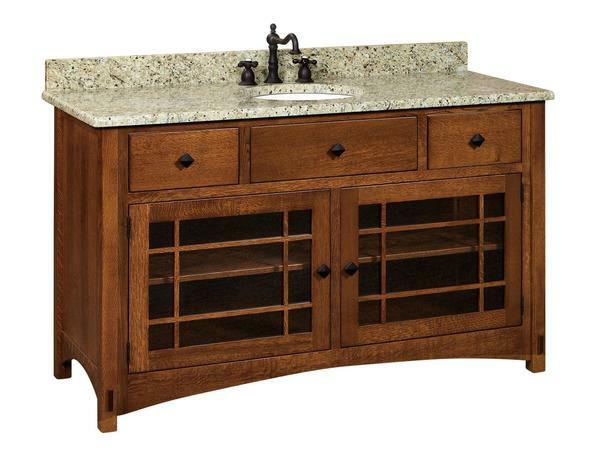 All of your needs have already been thought of by the skilled craftsmen who design and build your new vanity cabinet. Why not create a gorgeous getaway in your bathroom? The Amish 60" Lucern Mission Open Single Bathroom Vanity Cabinet will do all of the heavy-lifting, allowing you to enjoy its beauty with ease. Please give us a call at 866-272-6773 to discuss all of the possibilities for this piece.